Lightly grease a grill then cook your eggplants for 3-4 minutes on each side, once done set aside. In a pan add olive oil then sauté garlic and onions. Add the chopped tomatoes, paprika, cayenne pepper, cumin, oregano, basil and lemon juice; simmer in medium heat for 2 minutes. Add the chickpeas then season with salt and freshly ground black pepper. 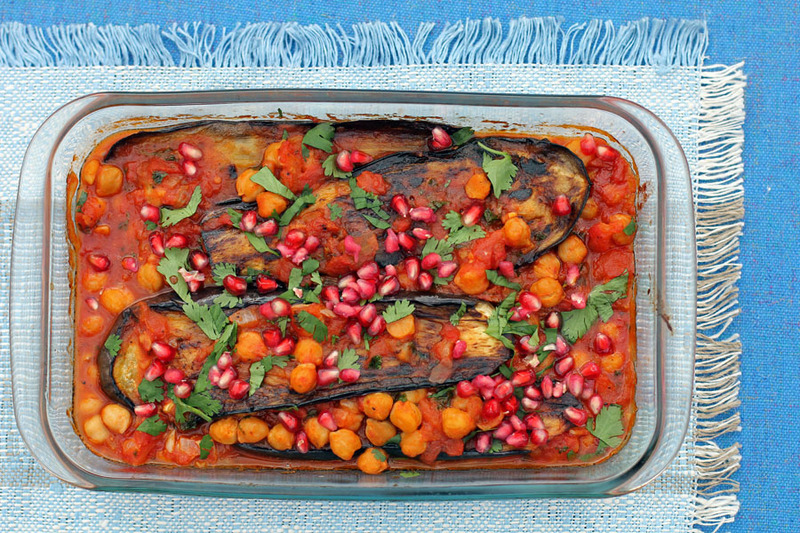 Place half of the aubergines into a casserole then pour half of the sauce over the top, layer the remaining aubergines then pour the remaining sauce on top. Bake in a 180C preheated oven for 20 minutes. Remove from oven then garnish with chopped parsley and pomegranate. Tip: For the pomegranate, to remove the seeds easily cut them in half then tap the outer skin with the back of the spoon until all seeds fall off. That’s a beautiful dish. Love the pomegranate. Like the colour of this dish. This seems simple and will definitely cook it soon 🙂 thanks. Such a different and colorful dish. What an interesting combination of flavors and such a colorful dish! 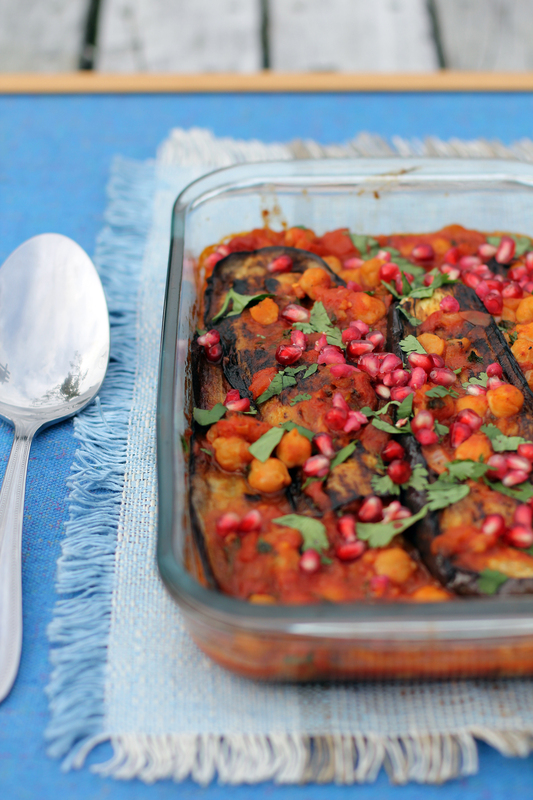 Aubergine and chickpeas… It looks so rich! I cook a lot of eggplant dishes and I have made similar chickpea mixes. Just have never put the two together! What a fun experiment ahead 🙂 ! pretty! look at those bright colors! I am all over this one Raymund! I never would have thought to put pom seeds with this as well. Can’t wait to try this one. I need a good eggplant fix. It’s been too long. Wow, absolutely gorgeous. Tons of flavors that I don’t normally cook with! This is creative and inspiring. Eggplant is usually tough for me to master but I am going to give it a try with this one! Yummy! I like the interesting twist of using pomegranate to garnish, it must have given it another layer of flavor.